I’m going to give it to the House again today. In a 57-43 vote on third reading, HB309 passed the House. Any legislator that tries to say anything else is either an idiot or a liar. That’s harsh, but I can’t say it any other way. Read the law. Please note – that was a 57-43 vote – upped from the 55-44 second reading vote. If anyone wants to check out the party break down on that, I’d sure appreciate it. As an aside, all the committee members have a party ID and the legislative roster shows party ID – why doesn’t the vote tally? The House eeked out another fretful bill today, HB384 will effectively remove the need to obtain a concealed weapons permit. It will bring concealed weapons into bars and restaurants. It’s another one of those crazy Rep. Krayton Kerns gun bills with Gary Marbut – a gun advocate so loony that even the sheriff and law enforcement organizations..and the NRA, as I hear it, can’t cozy up to him – thrown in as an expert witness. I watched this bill in hearing – and this was a hearing where Missoula’s Rep. Ellie Boldman Hill shined. That’s because as questions concerning how the bill would effect current law and law enforcement went to Gary Marbut (Montana Shooting Sports Association lobbyist) from the Republican members on the committee…Rep. Hill was smart enough to ask those same questions of actual law enforcement officers. So hows that for a law that (first of all) made it out of committee and (secondly) passed the House 52-47? The votes shifted on this bill to from a second reading vote of 59-40.
addendum: A second reading of a bill to abolish medical marijuana passed the House today too. In this case I’m going to say that the GOP is a damned lazy bunch. Rather than fix the thing – and they’ve had years of opportunity to do so, even and the behest of the industry and towns and citizens last session – they’re throwing out an initiative that was approved by 78% of the voters. You might want to call or email your legislators on that one and at least let ’em know how foolish they are. We have a fancy-schmancy statistics page that tells us (it isn’t too scientific or anything) who is reading what, where they’re linking in here from, and what they are searching on search engines to get to 4&20’s stuff. I don’t know if it’s a coincidence or anything, but “satan” has been running pretty high on the list lately, as has “John Hendrickson”. Do These People Not Resemble Brown Shirts? Anyways…just trying to make it easier on the voters, don’tcha know…. 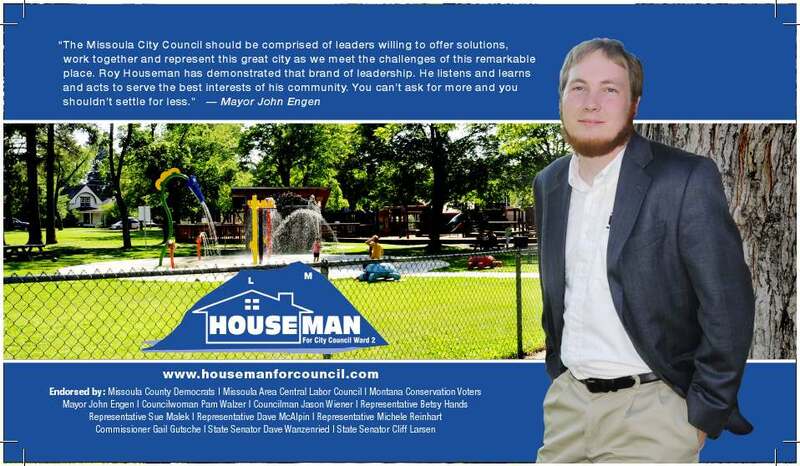 Meet Ward 2’s Next Councilperson – Roy Houseman, Jr.
Tuesday night is an opportunity to meet Ward 2 candidate Roy Houseman, Jr. – if you haven’t already. I can say enough about how much I really like this guy. He’s wise beyond his late-20something years, is union representative for Smurfit-Stone, married and owner of his first home with his lovely wife Andrea. We’ve mentioned him ’round these parts at least 4 times, including this piece and another one which linked to The Independent’s profile of Roy Houseman, done by Skylar Browning back in January. Ward 2 is a funky ward – encompassing the Northside, the Westside, Grant Creek, and north of Wyoming Street and generally east of Reserve. It’s a tough ward – I mean – imagine door-knocking Grant Creek..but Roy’s been at it. So much so that I hear that his wife is calling herself an campaign widow. Cynthia Wolken and LaNette Diaz are hosting a “Meet Roy Houseman” event. It’s at 1316B Cooper St (which is Ms. Wolken’s house), 6:30 to 9. This is, of course, a fundraiser – so any spare bucks you have would be a big help…but of course, offering up your time for calls or literature drops and door knocking would also be greatly appreciated. Well, it seems that Ryan Morton decided after “the birds at 4&20 paint[ed] me as some frivolous, MBIA automaton,” that he needed to shake up his campaign for City Council from Ward 1. So he up and quit his job (hat tip to Keila over at Montana Red Tape!). Dang, just when I thought we had the perfect argument going about conflict of interest and all, what with him working at the MBIA and lobbying Council on their behalf. Of course Ryan, an occasional commenter here (especially when we got into his professional lobbying business, or his campaign), had to throw a couple of bricks our way, as we challenged his dubious claim that working for MBIA and lobbying Council (which means he would have to lobby himself, which sounds oh, so yucky) somehow didn’t represent a conflict of interest. So I guess that’s gone by the wayside. 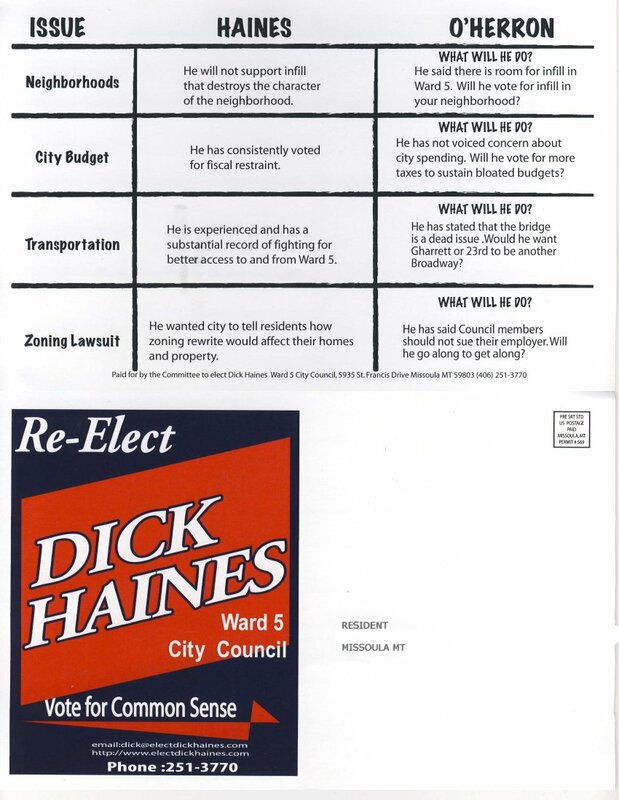 But, he reminded me in his comments at Red Tape that he is still working on the campaign for Kathy Greathouse, who is on the MBIA’s Board of Directors, and is running for City Council in Ward 6. Ah, so incestuous these MBIA people are. She also is (unless she’s looking for a new coat of paint too…) the chair of the MBIA Government Affairs Committee–which technically made her a boss of the org’s lobbyist–which used to be Ryan. Oh, and by the way, there is a real nice new job opening in town, which gives a real succinct definition of a lobbyist! · Develops and maintains effective lines of communication with local and state public officials on issues that impact the industry and association members. · Coordinates, promotes and participates in meetings held with government leaders and political candidates to advance the objectives of the association. · Attends and participates in government and community meetings and regularly updates the members regarding any issues affecting the industry. · Obtains proposed legislation and regulations for submission to committee for analysis and recommendations. Obtains relevant information on state and national issues and distributes to the committee and membership. · Establishes and maintains a grassroots network of members to assist on critical legislative and regulatory issues. –a lobbyist that Kathy Greathouse oversees in her duties on the MBIA Board, and maybe still as the head of its Government Affairs Committee. And maybe as a City Councilor. All in the family! 2006’s Initiative 151 raised Montana’s minimum wage and tied its increases, annually, to inflation. Donald J Steinbeisser, of Sidney, has proposed SB254 that would remove the inflation indexing and stall minimum wage at $6.90 an hour. I am shocked that a legislator would be working to subvert the will of the voters. I-151 passed with a huge majority – 285,535 to 107,294. Also proposed by Steinbeisser – a real friend to the working guy, I have to say /snark – is SB253, which would allow an employer tip credit against the minimum wage. This one is horrible in that it doesn’t even state a minimum of how low that wage would go. Both of these are in Senate Business, Labor & Economic Affairs, on Wednesday. University kids working at minimum wage? Motivate here – tell your friends. Pat Murdo is the staffer for the committee, pmurco@mt.gov. If sending comment, be sure to mention the bill by number and to note that you are submitting public comment. You can find information on how to contact these legislators directly HERE. Live blogging city council here. Can’t resist, as they just started budge cuts. Hendrickson just made a motion – to place a hiring freeze on all vacancies. He didn’t even ask what the vacancies were. Brett Ramharter: Obviously, this isn’t something that could be resolved this evening. This would have to go back to committee, because we have no clue what the real status is of these unfilled positions. I guess I need some clarification. We count on getting 2.85% in savings – the majority of that comes from personnel. That turns into about $1.2 million in savings. We budget for a year-end balance of a little over – approximately – $920,000 and with the $1.2 million in savings, we get about $2.1 million – that’s how we get there. So I guess the question that I’ve got – is this intended to just reduce the size of next years budget? Is that what we’re looking at? As opposed to get savings which are already factored in? Hendrickson: Yes, if you take 10 positions which are unfilled and have been unfilled and factor in even just $25,000 a year – that’s $250,000, not counting benefits. That would take you well over the $300,000 mark. So instead of raising the property tax 3.5 to 4.82 that would cover the shortfall and the administrative budget of $285,000 and then some. Brett: So as a point of clarification – this really isn’t focused on the type of savings I was discussing – this is just designed to make the budget smaller by $300,000+. Walzer: So if I understand this correctly, Mr. Hendrickson wants to reduce the staff by 10 positions. We don’t know what the positions are. We don’t know how the work is being done now. I know in places I’ve worked before, empty positions are often filled with overtime, which is costly and also difficult on employees – or even worse, being required to get the work done for more than one employee in just 40 hours. I think it’s unwise to just ax 10 employee positions that are open at the moment. That’s what I’m hearing Mr. Hendrickson say. I think the city’s done an overall good job of looking at the turnover rate and incorporating that into the budget. I can not support that. Childers: Asks the Mayor for clarification about Hendrickson’s continual referal to a city “shorftall” – he says: I am unaware of a city shortfall. Is there a city shortfall that I haven’t been informed about, Mayor?